That word is a good way to describe Bret Harte Elementary School fifth grader Shruthika Padhy’s spelling bee career. 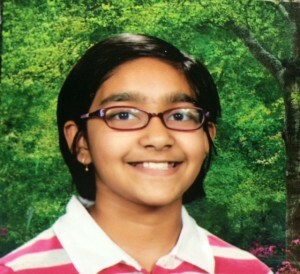 For Shruthika to make the trip to nationals, donors were needed to help pay the fee. A local nonprofit, the National Indo Cooperative Enterprises, a marketing company, Metasense Inc. and tutoring companies C2Education, Kumon and Mathnasium, all donated money to pay for about half of the fee. Shruthika’s parents, Uma Padhy and Sujata Sabat, paid the remainder. Another key quality to becoming a good spelling bee competitor is being able to think clearly while on stage. Being on stage doesn’t make Shruthika nervous. She prides herself on taking her time and focusing on each word as it is presented to her. Right now, Shruthika is doing extra preparation ahead of the national competition. She has been going through a copy of Webster’s Third New International Dictionary, the official dictionary of the spelling bee. Shruthika realizes the competition will be fierce and she will be going against students from as high as eighth grade. However, she is excited just to participate and hopes this year’s trip will be just the first of many to come.